Whether the site is large, narrow, busy or quiet it is inevitable that the volume of construction traffic will increase. Some days it could even appear as though the lorries are on a conveyor belt. Being mindful of this, the Health and Safety precautions automatically rise what with extra vehicles coming and going and added persons on site. Not only is the site affected but also the possible surroundings e.g. we have a school adjacent to our site and therefore we experience a high level of foot traffic at peak times crossing the entrance of our site. Taking all these factors into consideration, we have devised a ‘Delivery Driver Information’ sheet. 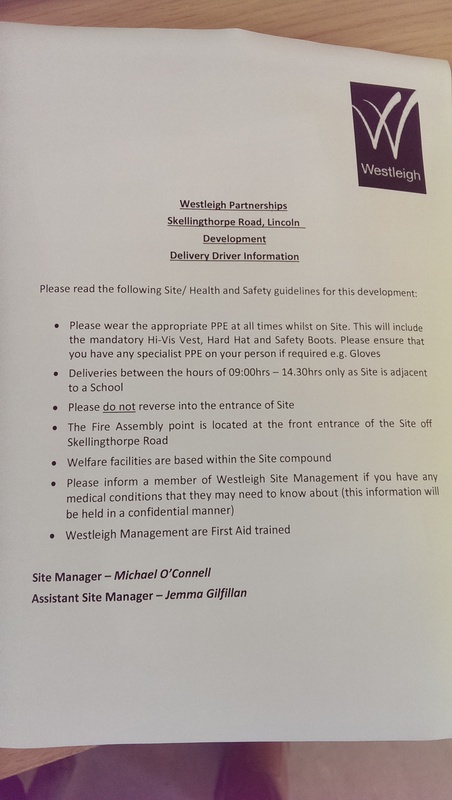 This sheet, which is presented to each driver that enters site, provides clear site specific information to ensure that safety on site and safety of the general public is met at all times. This could be anything from how to enter the site to selected delivery times. The sheet also contains a medical information request. This is purely confidential. We feel this is very important and although the driver may only come onto site for 5 or 10 minutes, the Health and Safety of the said driver is just as important as anyone else’s and if something unfortunate happened, we as the Management Team would know which direction to take to deal with that issue. This simple yet effective sheet can be altered as the site progresses or the surroundings change and although it contains quite obvious points, we find this works well. Personally we find the drivers adhere to the site specific rules and delivery times, thus allowing the movement of the conveyor belt to be smooth.